"This year marks the 50th anniversary of the opening of Pleasure Island. 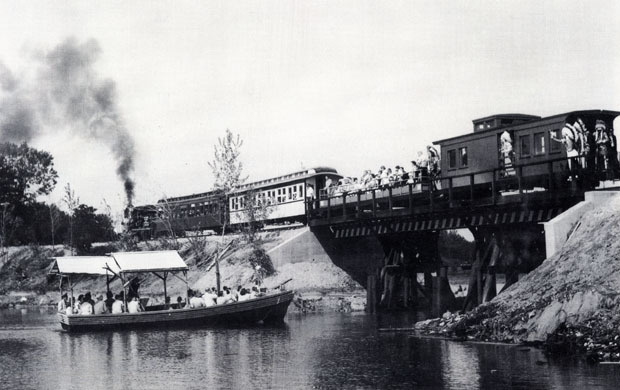 In this picture, a pirate boat heads toward Pirate's Cove, complete with its tree house, fort and pirate, as the Pleasure Island and Western Railroad train makes its way to the old Greenwood train station. The train was operated and run by Edaville Railroad. Pleasure Island was billed as Boston's equivalent of Disneyland. Bill Hawkes, president of ChildLife Magazine, and executives at Cabot, Cabot & Forbes, oversaw the project. Hawkes met with C.V. Wood, the first general manager and Vice President of Disneyland, and was said to have agreed to collaborate with Hawkes to build a Disneyland of the East. The company hired many former Disney employees to work on the project. In October, 1958, Pleasure Island, Inc. announced its plans to build a $4 million family amusement center in Wakefield. Pleasure Island opened on June 22, 1959." - Text from calendar by Jayne M. D'Donofrio. Photo courtesy of Bob McLaughlin. “Pleasure Island, 1959,” NOBLE Digital Heritage, accessed April 20, 2019, https://digitalheritage.noblenet.org/noble/items/show/7052.